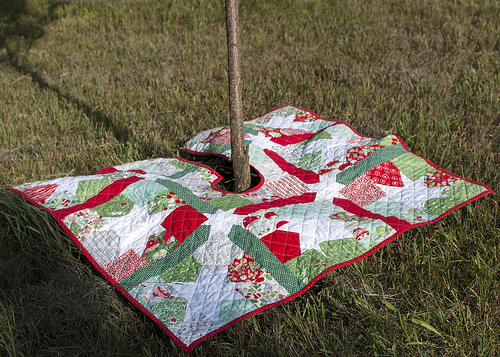 Today I'm excited to feature.... my very first, finished quilted project! It's hard not to catch the quilting bug when you are working in a fabric store every week. I had sewn some clothes and bags before, but never tried a quilt. Good thing I work at Pink Castle Fabrics and I live almost next door to Lynn of The Little Red Hen, right? In the fall I started an ambitious star quilt which I have not finished yet. But I got a lot of practice making liberated star blocks, so when Brenda suggested I make Happy Zombie's star-covered Tree Pants, I jumped on it! (What are tree pants?! 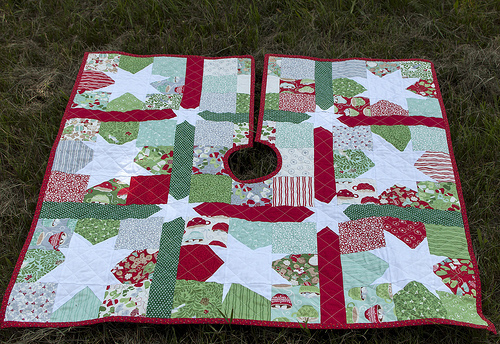 It's a square-shaped Christmas tree skirt). For the ultimate in Christmas-ness, Brenda asked me to use Kate Spain's In From the Cold line. There are all sorts of prints in this line - from cute gingerbread men, to tone-on-tone blenders, and a beautiful songbird print. I tried to arrange them all fairly randomly across the quilt. To separate the blocks I used strips of Rain in Red and Tiny Dot in Grass. The wonky stars are Kona White. Cutting & piecing this quilt was easy-peasy because I used two of the In From the Cold charm packs for the square star background. The charm squares are a little bigger than the pattern asks for and I had to make other adjustments for that, but really --- it just means you have more surface area on which to place presents under your tree, and there can't be anything wrong with that. I was able to piece this quilt together myself, but it wouldn't look anything like a quilt if it weren't for Lynn's help and teaching and my boyfriend finishing the straight-line quilting for me when I got too frustrated. Oh, P.S. they both took all the photos for this post as well, because I had to go out of town. They're such helpers! 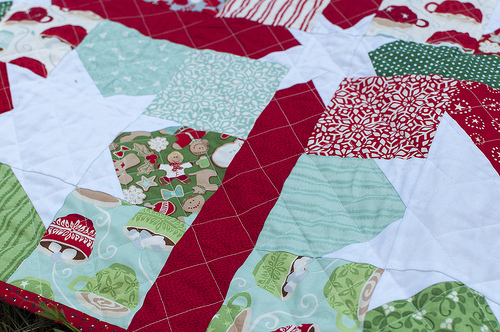 Check out other great projects made from Pink Castle Fabrics in the flickr pool!